For the audio technology, see Reel-to-reel audio tape recording. For other uses, see Reel to reel (disambiguation). 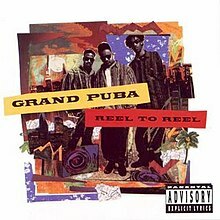 Reel to Reel is the debut album by American rapper Grand Puba. The album was released on October 20, 1992 under Elektra. It was Puba's first solo venture, following group projects with the likes of the short lived group Masters of Ceremony and Brand Nubian. Both of the group’s albums were critically acclaimed but failed to duplicate that success in terms of album sales. The album was largely produced by Puba himself, with help from the Stimulated Dummies, Kid Capri and others. Reel to Reel includes the number one Rap hit "360 Degrees (What Goes Around)", as well as the singles "Check it Out" (featuring a young Mary J. Blige), and "Ya Know How it Goes." tracks 14 and 15 are listed as bonus tracks; "Who Makes The Loot" only available on the CD-release of the album. ^ "The New Rolling Stone Album Guide". This page was last edited on 27 October 2018, at 00:29 (UTC).